The year is 1953 and Penny Falucci is spending the summer listening to Dodgers' games on the radio and hanging out with her large, eccentric Italian family at every opportunity. Her mother doesn't seem to approve of her spending quite so much time with her late father's side of the family. When her mom starts dating the milkman, a wedge is driven even further between them. And Penny's starting to get frustrated that no one will tell her exactly how her father died. Summer's not all it's cracked up to be, but there's enough good to balance out the bad. Penny loves playing baseball and delivering groceries with her cousin and best friend Frankie. Her uncles shower her with presents. And there's always butter pecan ice cream. I hate to give too much of a summary because some of the events in the book were so surprising to me. I don't want to give anything away. Based on the author's own Italian relatives, the members of the Falucci family are the real stars of this book. Penny's got a horde of uncles looking out for her, a super chef Italian grandma, and a firecracker of a cousin whose biggest ambition is to be a criminal mastermind. Her favorite of the uncles is her Uncle Dominic, an eccentric man who lives in his car, wears slippers instead of shoes, and is the biggest Dodgers fan she knows (besides herself). If you're looking for a warm-hearted story about a wacky, but loveable family, look no further. 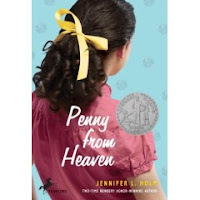 The other thing I really liked about Penny from Heaven is the historical detail that make the period come to life. Many of the events in the book are based on anecdotes told by Holm's family members. And it explores a forgotten bit of WWII history that I've never read about before. Holm includes an author's note (with pictures!) about the time period and introducing the people on whom the story is based. If you'd like to read a more in-depth summary including spoilers (I don't generally believe in spoilers, but I was SO surprised that I don't want to ruin that for anyone else), I'm going to send you over to Amazon to read the SLJ review. I was really surprised at the plot twists in this book, too. I think your review is right on the money.